Mercedes-Benz has been voted ‘fleet manufacturer of the year’ by readers of Fleet News at the magazine’s 2018 awards. In another key category at the 40th annual Fleet News Awards, BMW’s 5 Series scooped the gong for ‘new company car of the year’, fending off stiff competition from the Ford Fiesta – Britain’s best-selling car – and the Volvo XC60, which claimed the title of ‘UK car of the year’ last month. The Jaguar XF Sportbrake, which was named ‘company car of the year’ at the annual SME Company Car of the Year Awards last week, also lost out to the mighty Beemer. Stephen Briers, editor-in-chief at Fleet News, said Mercedes-Benz earned the fleet manufacturer award after completely re-evaluating and improving its fleet customer journey. He explained: “It has engaged the retailer network in the process and introduced new initiatives that meet fleets’ needs and match the quality of its outstanding model line-up. 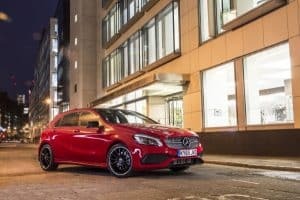 Rob East, head of fleet at Mercedes-Benz Cars UK, said the award was made even more special because it reflected the opinion of Fleet News readers. “It’s our hard-working, dedicated team and retail partners who have made this possible,” he commented. SEAT was commended for its recent fleet efforts, collecting ‘most improved fleet manufacturer of the year’ due to ramping up engagement with fleets and leasing companies, as well as the launch of some excellent new models. Other notable categories saw TrustFord win ‘fleet dealer of the year’, while the AA was named the year’s best fleet supplier. Additionally, Skanska UK’s Julie Madoui was hailed ‘fleet manager of the year’.